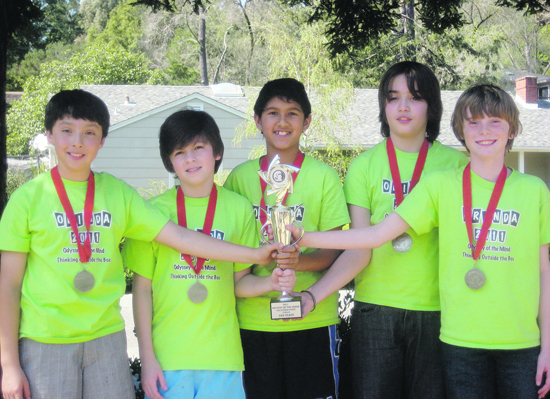 When the winners of the Odyssey of the Mind State Competition were announced, the team of six Del Rey fifth-graders was ecstatic. Only the two top teams in each division would advance to the World Finals in Maryland, and the Del Rey team had just been awarded second place. "The feeling was amazing!" exclaimed Avery Maybury, the team narrator. With its exciting win, the Del Rey team will soon be heading to the University of Maryland, where it will compete in the Odyssey of the Mind World Championships taking place May 27th through May 30th. Odyssey of the Mind is a worldwide competition that introduces students to the art of problem solving using creative methods by thinking 'outside the box.' When the school year begins, each team (up to seven members) must choose one of five pre-defined problems from a variety of categories. They then work on creating an eight-minute presentation that demonstrates their solution to the problem in an entertaining and creative manner. At the competition, judges grade the performances based on imagination, creativity, style, the use of props, backdrops, and costumes, and how well everything blended together. Team member Edward Anaya believes that the key to winning Odyssey of the Mind is to, "always be creative, take your time, stay committed, and believe in your team." The fifth-grade Del Rey team chose the Rube Goldberg problem that had the stated goal of over-complicating a simple tool. The team took the idea of an alarm clock and turned it into an elaborate contraption. Doing away with the annoying alarm sound, their alarm clock ultimately lowers a food item close to the sleeping person's nose, allowing one to wake happily to the smell of his or her favorite food. With this innovative invention the squad won first place in the regional competition and advanced to the state finals where they finished in second place. Team member Nick Luckenbach said, "I have never been to a World competition before. I'm interested in seeing all the creative ideas that others have come up with." After a team finishes with the presentation of its chosen problem, they are then asked to respond to a completely spontaneous prompt from the judges. Teams never know in advance what they might be asked to do during the competition. They are given one minute to think of a response to the prompt and four minutes to act out their response. The prompt given to the Del Rey team was, "The last thing I remember was..."
Thinking fast on their feet, some of the responses included, "eating noodles on mars," "a cute guinea pig in the sky," and "somebody saying, 'Look out!'" The creativity and number of their spontaneous responses earned the team first place in the state competition. Kirsten Theurer, principal of Del Rey, said, "It's just so wonderful to see kids work hard together to get them to the place where they are today." Eric Pawlakos is a junior at Miramonte High School.